Make sure you are not printing in grayscale. You might also have to check the box for “background images” to have your chartt printed in color. Working on it. Small team, loads of stuff to do. But it’s definitely a priority. Unfortunately not yet but we are working on a solution for that. Before you leave, would you please tell us what the main reason was, that made you want to delete your account. We want to improve agantty and make it a better fit for you in the future. Leave us a note at and help us to make agantty great again :) info@agantty.com. Would be really appreciated! Many agantty users asked for ical sync, so you can import your agantty ganttchart projects into google calendar oder apple ical. Click on “Export and publish” and select “calendar export”. Copy the givin link and go to „Other Calendars” in Google Calendar (Look at the bottom left ;)). Click „Add by URL” and copy/paste the agantty address that is provided above. 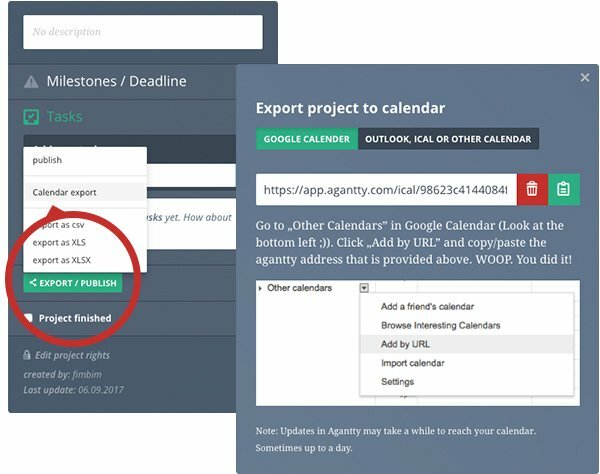 Now you can sync agantty to any calendar via a public link you can generate for any project now. Your project tasks with colors and due dates will be synced after importing the url. If you just want to share the calendar with any college or customer once, you can generate a sharable link that will not update after changing something in agantty.